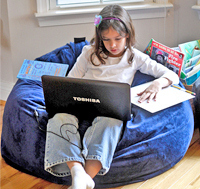 Bean bag chairs are needed for regular use, during school and when doing anything else. These provide support for sitting while being incredibly comfortable, giving your child something to sit on without a problem no matter what they are doing. Since these are soft and easy to use at all times, they are the perfect choice for studying, working, and having fun. Regular chairs may cause the body pain, which gets in the way of doing work. With pain comes distractions and the unwillingness to work, getting in the way of high grades and desired results. Bean bags take away that pain and the problems that come with regular chairs and leave only comfort, something all children need. Another great thing about bean bag chairs for kids is that they come in many different shapes, sizes, and appearances. No matter what your child likes or needs, you can find something suitable to him or her. This increases your child’s love of what they have and makes him or her more willing to use it. When they have more fun with their bean bag and are using it more often, they are even happier. You can teach your child more effectively and be sure that nothing is going to stop them from learning. When a sturdy place for work is needed, you are going to need a desk. This provides your child with a way to do their work on a solid, comfortable surface. Since relying on legs or the floor for doing work will quickly become bothersome, you are going to need a desk to do it all. While the purpose for the desk is straight forward and simple, their appearance is not. You can find desks in many styles and sizes to fit every child. You may even find something that will grow with your child, providing him or her with a reliable place to work throughout the years. Just like the desks, the writing items are also straight forward. These provide your child with a way to write down notes and have everything accessible. Since notebooks, papers, pens, and pencils are easily storable and usable, all children will be able to use these effectively and when they need them. There are many types of notebooks, pens, and pencils out there. Your child can find something simple that does the job or something that adds a little more fun to the work day, whatever he or she wants. Laptops and tablets are incredibly useful for home schooling. These provide far more space and a way to make studying even easier because of the internet. While these do work wonderfully, it is important to remember that the internet can also cause a child to become distracted. Since you do not have the type of restrictions that schools do with your home internet, you are going to need to look into ways to make sure your child is using this how they are supposed to use it. By setting up parental settings and checking to make sure they are not using this in a way they should not, you can be sure that there is nothing getting in the way of learning. The internet also makes learning more fun and better as a whole. You can use educational videos and games to make your child more interested in learning certain subjects. These types of games and videos make learning more enjoyable and may even stick with your child more than regular learning would. This may be a bit extravagant, but noise as a whole can become distracting. When people are talking and there are things going on in the background, focusing on work is more difficult. In a home, it is hard to stop all sounds since that is where people are living life. Phones ring, the UPS guy comes by, the dog barks... You do not have the opportunity to keep a room as quiet as you can in a classroom (well, theoretically you can keep a classroom quiet with proper discipline), which is where sound cancelling headphones can help. These can give your child total silence so that they can concentrate on what is important and only that. If your child works better with music, these are a great way to give them a way to leave out all other sounds so that he or she can concentrate wholly. There is nothing else getting in the way, only the music and their work. Check out a few at Amazon.com. School papers will build up and become problematic. They become messy and it is difficult to manage everything. Having some type of organization set up in place gives your child a way to sort everything so that they have access to what they need at all times and there is no mess. These types of containers are very easy to set up and you can buy as many as you need. When it is time to expand, you can buy more to make sure there is always enough. While your child may have a bean bag chair, there is also a need for a regular work chair. This provides him or her with an easy way to use the desk and remain comfortable. Of course, to have that comfort, you do need to find something that is quality. So many chairs out there can cause problems and result in pain for your child, something no person wants. By making sure your child can focus without fear of experiencing pain simply from sitting, you can avoid problems with their back and concentration. Like the bean bags, regular chairs, too, come in many different shapes, sizes, and styles. You can find something of a certain look or size that your child actually likes, which makes them happier overall. When that chair is also quality and comfortable to sit in, you have something that is usable for work for longer hours. Having shelves gives your child a way to store books when not in use. Since these are simple and make organization possible, your child can use them for everything school related. As long as you are homeschooling your child, they can use shelves to store reading material and text books. Small paper pads and a bulletin board, like a cork board, make it easier to keep everyone informed and on track. This is a great way to tell your child what they have to do and to give them constant, up to date information on everything school related. Your child can also use this to keep work organized and visible to you. Whenever they are doing a large amount of work, they can use the board and notes to give you the information you need. You can get a cork board for about $20 at Amazon.com or your local craft shop. Or, use cork tiles and create a cork wall! During the lessons, a chalk or dry erase board will help you to teach your child in a better way. Many children learn better with visual aids and many lessons are hard to explain in just words. This is beneficial for both teacher and student, you and your child. A great thing about these types of boards is that you can have your child have a more active role in their learning. Rather than simply writing down notes, they can go along with the lesson on the board and say everything that is happening along the way. Lessons are more likely to stay with a child when they are using what they learn right away, and this is a great way to have them use what they are learning. Kudos to all parents that take on the task of homeschooling. I know, by experience, that it's not easy! Hopefully the environment you set up will help make it just a little bit easier! Our special thanks to Jill, guest blogger and homeschooler, for this post.